A criminal complaint issued last week alleging members of Iran's Revolutionary Guard Corps Quds Force plotted to kill the Saudi ambassador to the United States triggered bi-partisan outrage in Washington and international condemnation. The plot, had it not been interdicted by federal law enforcement, was seen as a potential act of war on American soil by a hostile regime. Secretary of State Hillary Clinton labeled it an international act of terrorism. But there has been an odd silence from America's national Islamist organizations. None has issued a release on the case. And when officials from the Council on American Islamic Relations (CAIR) have commented, they have criticized the government's case and spoken in defense of the Iranian regime. Executive directors Zahra Billoo of CAIR-San Francisco and Dawud Walid of CAIR-Michigan challenged the case's legitimacy, calling out Attorney General Eric Holder and accusing the FBI of fabrication and entrapment. The plot unraveled when Mannsor Arbabsiar, a naturalized American citizen of Iranian descent, reached out to what he thought was a representative of the Zeta drug cartel to carry out the attack. The representative really was a Drug Enforcement Administration informant who recorded Arbabsiar's conversations. Arbabsiar is in custody, charged with conspiracies to murder a foreign official, to use a weapon of mass destruction, and conspiracy to commit an act of international terrorism transcending national boundaries. Since then, CAIR-National has linked to an article on a leftist website from its Twitter account, posting the headline, "US Officials Peddle False Intel to Support Terror Plot Claims." "Not believing AG Holder on Iran-Mexican drug cartel alliance," Billoo, of CAIR-San Francisco Bay Area, said in a Twitter post. 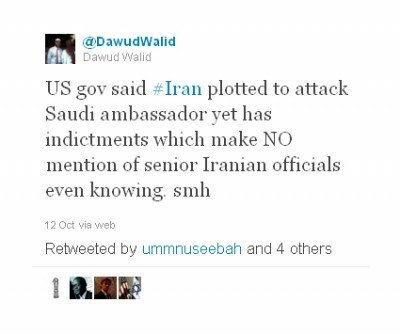 Similarly, Walid rejected the Obama administration's intelligence detailing Iranian involvement. "If Holder hadn't announced so many 'foiled' plots that were really FBI provocateur led, I'd be more inclined to believe this #Iran plot biz," said Walid. That post appears to have been taken down. A second Twitter post challenged the government's case. "Obama said evidence released but not there is none about senior Iranian officials. I read the comments carefully." He issued a similar tweet doubting claims Iranian officials were involved a day earlier, adding the Internet slang "smh" for "shaking my head." No one has said the evidence has been released publicly. The complaint alleges that Arbabsiar was working with a Quds Force officer and arranged to have $100,000 wired into a bank account as a down payment for killing the Saudi ambassador. Such action, officials say, could not have been done without the knowledge and tacit approval of senior officials. 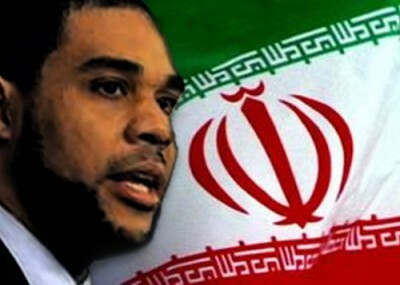 Walid also circulated Iranian President Mahmoud Ahmadinejad's denial of the plot on Al-Jazeera English. The "U.S. accusations over plot are attempts to divert attention from its own problems," Ahmadinejad said. Walid routinely complains of perceived injustices by American law enforcement. He spent a year trying to cast a 2009 shooting of a Detroit imam as unjust, even though Imam Luqman Abdullah fired first as FBI agents tried to arrest him. Abdullah had long vowed not to be taken peacefully and none of Walid's allegations of wrongdoing were substantiated in a series of subsequent investigations. 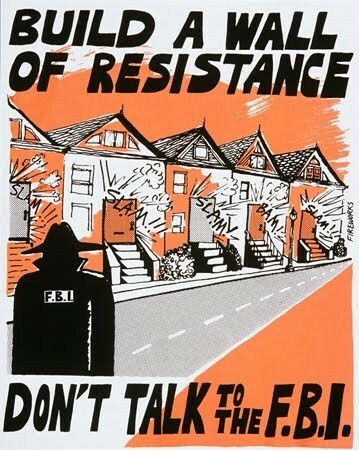 Billoo's San Francisco chapter drew attention early this year when it promoted a "Know Your Rights" event with a poster urging people to "build a wall of resistance" from the FBI. She also criticized a sting operation that led to the arrest of a Muslim man who thought he was detonating a bomb at a Portland Christmas tree lighting ceremony. "The question is, are we looking to stop radicalization and stop extremism before it becomes a problem or do we want a sensational story?" Billoo told a local television station. "And I'd really argue here that the FBI was looking for a sensational story." CAIR's silence is reminiscent of its reaction to the Iranian regime's brutal repression of the peaceful anti-Ahmadinejad protesters after the June 2009 presidential elections. No statements of solidarity with the protesters. No calls for the violence to stop. The situation could be putting CAIR leaders in a bit of a bind. They have had positive interactions with Iranian media and government, but they also are reliant on wealthy Gulf donors for operating funds. In 2006, CAIR officials traveled to Saudi Arabia, a majority Sunni kingdom, seeking millions of dollars in support, State Department records obtained through the Freedom of Information Act show. In this case, CAIR might argue it is preserving its connections to the Iranian regime because they can have a benefit. Executive Director Nihad Awad was part of an interfaith delegation that traveled to Iran last month to help free American hikers, Shane Bauer and Joshua Fattal. But CAIR officials also often appear on the Iran's government-controlled English language news outlet, PressTV, where they criticize American policy or complain of the "plight" of Muslims in America. In particular, CAIR spokesman Ibrahim Hooper recently argued about the rise of Islamophobia in America for "political reasons" on PressTV. Ahmadinejad has come to New York in recent years to address the United Nations General Assembly. While many Western diplomats walk out during his remarks, American Islamists seek audiences with him. 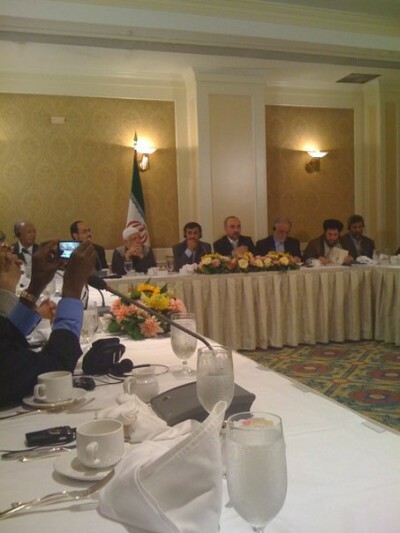 CAIR Executive Director Nihad Awad, obstructed by the camera, is two seats away from Ahmadinejad. Awad spoke at a 2009 interfaith program Ahmadinejad attended while in New York. According to a letter from Joseph Gerson of the pacifist Quaker group, the American Friends Service Committee, Awad "stressed that Islam teaches the importance of justice – even in response to enemies, and that terror must always be condemned and rejected. Likewise, other Islamist groups in America, such as the Muslim American Society (MAS) and the Muslim Public Affairs Council (MPAC), also remain silent on the alleged Iranian attempt to mount an attack on U.S. soil. Given a chance to speak directly to Ahmadinejad in 2007, Mahdi Bray, then the director of MAS's political arm, said nothing about Iranian government repression, but was quick to slam the United States for "the injustices that are heaped upon Muslims right here in America." Bray repeatedly told the Iranian leader "we share your vision" and that Allah demands his people confront injustice anywhere in the world. "We do share your vision that we must actively – actively – embrace this vision of resisting injustice no matter where it may be," Bray said. "Injustice anywhere is a threat to justice everywhere. Therefore, we share your vision for justice for all the people of the world." It's not as if CAIR, MAS and other national Islamist groups are shy when it comes to foreign affairs. In a statement following a U.S. drone strike which killed American-born al-Qaida cleric Anwar al-Awlaki last month, CAIR distanced itself from Awlaki's violent rhetoric, but also expressed concern about due process rights for Awlaki, an American citizen. These organizations have actively supported the non-violent Arab Spring uprisings against dictatorships in the Middle East and North Africa. Yet they have nothing to say when the Islamic Republic of Iran is implicated in a plot to assassinate a Saudi ambassador on American soil. I suspect that Walid and Billoo do not represent institutional wisdom, on this or on much else. They're token domestic Muslims. They're both young. Neither is terribly smart. Neither can frame a coherent sentence, or spell. And both _repeatedly_ deviate from the party line. I doubt Billoo even knows the Ikhwan pay her bills. And as for Walid, he can't distinguish between a Muslim thug who dies in a gunfight with cops and an Islamist cause worth institutional capital. They're likely repeated embarrassments to folks higher up the food chain. On Arbabsiar and Iran, the MB USA is caught in the classic ikhwan dilemma. The Brotherhood has always tended to be ecumenical, and is sincerely happy to work with Shiites. Wahhabi paymasters know history and are playing a longer game. They're also looking across the Persian Gulf at some pretty dangerous hardware, and it's pointed at their livelihood. What a Brother to do? Condemn Iran and they burn hard-built briges to Iran -- and alienate the global Muslim cheering section for Hamas. Defend Iran and they burn their main source of funds, and risk angering the many, very powerful domestic Wahhabis, who own and run so many important Sunni mosques. Times have changed. It's not like the 1970s and 1980s -- while Gulf Arabs are happy to pay the Brothers to make a mess elsewhere, or to work with them in matters of high finance and money laundering, the Ikhwan are no longer much welcome when it comes to corrupting local Muslims. Most modern Saudi youth now think of Said Qutb as a heretic, and their clerics concur. Meanwhile, the Ikhwan just stare and ask, "What's wrong? What'd we do? Can't we all just get along?" It'll be interesting to see if the Brothers can work with the salafis in Egypt. I doubt it, especially once the economy finishes collapsing. The rift between Wahhabis and Ikhwan needs to be exploited. Heck, let's throw the Twelvers in the cage, too. These people are nothing but terrorist supporters. Long live Israel !